*Respect Builds. No building on/under/to close to other builds. *No hacking or cheating. No mods/exploits that give you an advantage. *No advertising or spamming. Don't say other server names/ips, no threats to the server. *No offensive chat/skins or builds. No discrimination, no vulgar chat or builds. *No AFK machines. No bypassing the 30min AFK auto kick, will lead to a 1 day tempban. *No lag-causing redstone devices. Don't leave redstone devices on 24/7, must have an on/off switch. *No disobeying staff. Listen to staff's warnings and instructions. *No player killing in Vanilla. Keep pvp in the arena. *No offensive chat/skins or builds. What If you are banned? 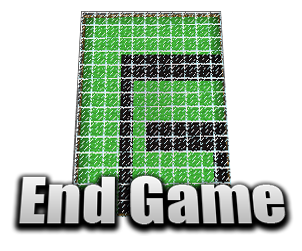 you may appeal at www.endgameserver.com/banapp. However, there is no guarantee it will be accepted. What results in a permanent ban? See someone breaking the rules? Report it at www.endgameserver.com/banrequest. Keep in mind you need complete proof whether with screenshots or otherwise. 1. No spamming. This includes doubleposting(posting twice without replies) and necromancing(posting on old, dead threads). 2. No server advertising. Don't post names or ips of other servers. 3. Be respectful to all players. No foul language, racism, or offensive language. Note: Forum Posts and Shoutbox shout's are subject to be deleted if need be.